At Sugarbaker Oncology Associates and the Washington Cancer Institute, we are committed to helping people face the challenges that a cancer diagnosis brings. Therefore, we have created the Cancer Patient Education Resource Center. The goal of our program is to help individuals understand their decisions about health care. We also hope to assist cancer patients in enhancing their quality of life by helping them develop skills to cope with the disease and by encouraging the support of family and friends. Washington Hospital Center is a 926-bed, private, not-for-profit teaching hospital located on a 47-acre medical campus with Children's National Medical Center, National Rehabilitation Hospital and the Veterans' Administration Medical Center. 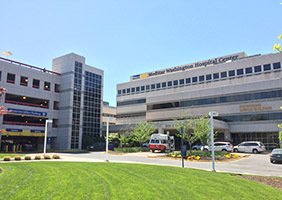 As the largest teaching hospital in the Washington area, the Washington Hospital Center trains more than 220 residents in 13 specialties, as well as students of medical technology, radiology and pastoral care. Some of the many respected specialty areas at the hospital center include: The Washington Cancer Institute, Washington Heart, The Burn Center, Women's Services, Transplantation Services, MedSTAR Shock/Trauma service, Washington National Eye Center and the Institute for Asthma and Allergy. The hospital center is a member of Medlantic Healthcare Group, which includes National Rehabilitation Hospital, Visiting Nurse Association, Home Infusion Specialists, Center for Ambulatory Surgery Inc. For Visitor's Information, please see the Washington Hospital Center's Home Page. You will find specific information regarding parking, public transportation, patient and guest services, accommodations, visitor's hours and a few useful telephone numbers. You will find Directions and maps of the Washington Beltway, the Irving Street Vicinity and the Hospital Center Complex to help you find your way to your destination at the hospital center. The Washington Hospital Center has negotiated special rates with a number of nearby hotels. These reduced rates are available for patients and families from out of town, for consulting groups, as well as for personal use. The key people on your healthcare team are, of course, you and your doctors, who supervise all aspects of your care. Many other people play a role in seeing that you get good care. Make a point of asking staff members about their jobs. Their functions usually are quite specialized, and knowing what each person does can help you stay informed. Remember, you are the most important member of your health care team. The Insurance Warrior - The website offers answers to your insurance questions, and the book explains -- step by step -- how to work with your health insurer to ensure that your treatment is covered. Colon-L - A moderated discussion group for patients with colon cancer. Very good resource for support, referrals and some medical information. Cancer Net - A very good site for disease / treatment information from the National Cancer Institute. CenterWatch - A list of >1000 clinical trials with profiles of centers conducting clinical research, newly approved therapies, background of clinical research and a helpful patient notification service. NCCS Guide to Cancer Resources: CanSearch - A Guide to Cancer Research on the Internet, courtesy of the National Coalition for Cancer Survivorship. The purpose of this guide is to assist those not experienced in finding sources on the internet. NORD - National Organization of Rare Diseases. Information about both rare / orphan diseases and not-so-rare diseases. Further Info on Mesothelioma Cancer - Detailed information on Symptoms, Treatment options and support.